Next generation hygienic pallet launched! This entry was posted on March 6, 2015 by Goplasticpallets. 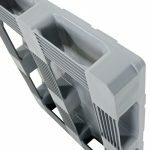 Goplasticpallets.com has introduced to its range a new, improved version of its Hygienic pallet, which has been optimised for superior performance in automated conveyor systems. The new Hygienic pallet comes with a number of enhanced features. Rounded corners on all sides ensure the smoothest transition through automated conveyor systems and minimise the risk of pallets getting trapped and damaged – as is often the case with wooden pallets. Curved sloping ramps on both sides of the perimeter base allow pallet trucks to easily access and leave the pallet, even when it is empty. This feature is a huge safety benefit as it means that hand pallet trucks can more easily secure and move the pallet without dragging it across the floor. In addition, special angles on each of the four corners make stretch wrapping palleted goods much simpler. Manufactured from the highest food grade virgin HDPE, the new Hygienic pallet has totally smooth, sealed surfaces and is fully compliant with EU safety legislation. Free from joints, slots and other cavities, the Hygienic pallet has been specially designed to prevent the accumulation of dirt and dust, ensuring optimum hygiene conditions are maintained throughout the entire handling process. The unique design also means that the new Hygienic pallet is quick and easy to clean. And, like all medium and heavy duty plastic pallets, it is strong and robust offering a reliable, consistent performance throughout its long working life. The new Hygienic pallet measures 1200mm (L) x 1000mm (W) and is available in seven striking colours as standard – red, green, yellow, blue, beige, grey and white. Additional colours, including two-colour options and printed branding for personalisation are also available for large orders. Be the first in the UK to experience the benefits of the new Hygienic pallet and call us today on 01323 744057. Alternatively you can request a quote or email us at [email protected].